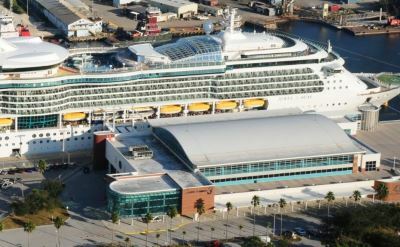 The Tampa cruise terminal is located on the channel downtown, close to Ybor City. It is about five miles from Tampa International Airport. There's a lot to see and do around the Tampa cruise port complex. Tampa Port officials have worked with the community to develop a lively downtown waterfront. An entertainment complex called Sparkman Wharf (formerly Channelside) is a short walk from the Tampa cruise terminals. It offers entertainment and restaurants in a comfortable water-side atmosphere. The Florida Aquarium is between the cruise terminals, home to over 10,000 aquatic plants and animals from Florida and all over the world. 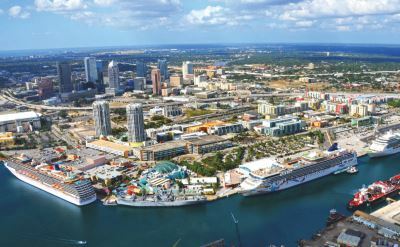 The video above provides an aerial view of the Tampa cruise port. It's just 3 minutes and interesting. There are several hotels near the Tampa cruise port for your use before or after a trip. A parking garage for cruise terminals 2 and 3 is at 810 Channelside Drive. Parking for terminal 6 is located next to the terminal. Driving directions: Take I-275 to exit 44. Follow N Tampa Street to S Franklin Street. Turn Left onto Channelside Drive. Parking garage on the left. You certainly don't have to rent a car. Other Tampa airport to cruise port transportation options like taxis and shuttles are available. Enjoy your cruise from the Tampa Cruise Terminal.